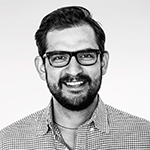 Rafael Rizuto is Executive Creative Director at 180LA and one of the creative forces behind projects that include UNICEF "UNfairy Tales," Boost Mobile’s "Boost Your Voice," Expedia's "Dream Adventures" and the University of Phoenix's "We Rise" campaign. The Brazilian joined 180LA in 2015 from Pereira O'Dell San Francisco where he created campaigns for Airbnb and Coca Cola. He is a frequent award show judge and speaker, and was recently named to Ad Age’s top "40 Under 40" list and dubbed "30 Most Creative People" by Business Insider. A 50-inch statue of a confident girl and a life-size model of a man designed to survive a car crash will be happily ever after dancing on the awards stage, writes 180LA's executive creative director.